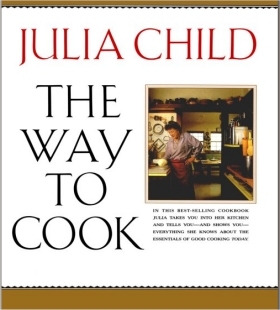 Julia Child’s The Way to Cook. I have all of Julia’s books, and they are all amazing. This one is a combination of traditional recipe book and technique primer. While Mastering the Art of French Cooking is definitely her pièce de résistance, The Way to Cook is my favorite. She published it after she had gotten really good at writing cookbooks. Mastering was her first go at cookbook writing. In The Way to Cook, Julia branches beyond strict French recipes and includes recipes like Rhode Island Jonnycakes, curries, and pies in its 528 pages. The book is also a fount of technique information…how to break down a chicken or fillet different types of fish, understanding cuts of steak and how to properly cook each one, how to “French” green beans and prepare and store fresh spinach. It’s also packed full of personality as Julia directly addresses the reader throughout. “I have eaten, and even cooked, green vegetables prepared by the rules of nervous nellies, in which sprouts or green beans were boiled in a small covered pan. One reason, I am sure, that many people hate vegetables is because they are cooked like medicine!” I doubt there’s a more-loved food personality in all of American history, and this cookbook is her best. Alton Brown’s I’m Just Here for the Food: Food + Heat = Cooking. This is the first cookbook I ever received as a gift. My buddy Justin gave it to me 11 years ago for my birthday just after it was published. He was probably only 18 at the time, and he had no clue what an impact it would have on my life. Back then I was cooking, of course, but my culinary journey was in its infancy. I was still cooking the Southern classics I was raised on, along with a few international classics I had learned while staying with families in other countries. But I was a recipe follower. And back then I thought that recipes could always be trusted to produce a perfect result. Reading Alton’s book about the SCIENCE behind cooking was eye opening, to say the least. Yes, it has recipes. Very good ones. But this is a book about WHY and HOW food cooks. It’s the first time I had ever heard about brining, though the restaurant industry had been doing it forever. After reading this book, I became obsessed with understanding and mastering the techniques that make a cook really great. When you understand the chemistry and physics behind why meat browns when it gets hot, you’ll be able to manipulate heat to deliver perfectly seared scallops, a crusty steak, and roast chicken with delectably crunchy skin. 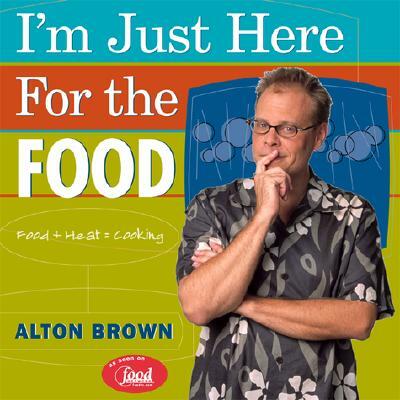 Alton’s book was a decade ahead of its time, and is still one of Amazon’s top 100 cookbooks in terms of sales volume. It won the James Beard Award for best reference cookbook in 2002. It was updated in 2006, so don’t be alarmed if the copy you’re buying says Version 2.0. While we’re talking about him, Alton’s companion book I’m Just Here for More Food: Food + Mixing + Heat = Baking is a fabulous introduction to the chemistry and physics of baking…something that seems to stymie a lot of home cooks. 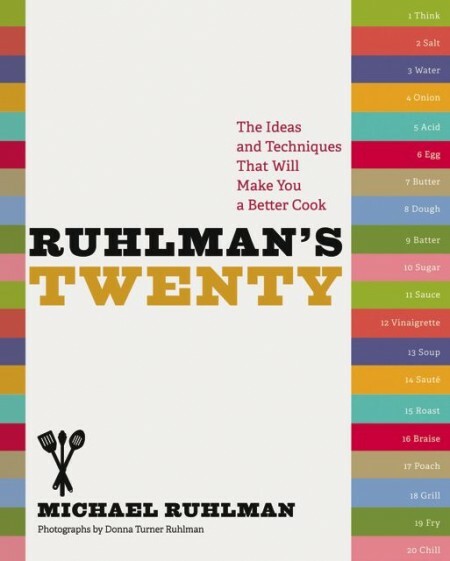 Michael Ruhlman’s Ruhlman’s Twenty: The Ideas and Techniques that will Make You a Better Cook; 20 Techniques, 100 Recipes, A Cook’s Manifesto. Any avid food reader knows Michael Ruhlman. Likely the most prolific food writer of our time, he has co-authored many cookbooks with Thomas Keller…likely the most respected chef of our time…as well as Eric Ripert and Michael Symon. In the late 90s he delved into the underbelly of the Culinary Institute of America to begin his trilogy of books on the role of chefs in our society: The Making of a Chef, The Soul of a Chef, and The Reach of a Chef. Ruhlman’s Twenty is his first solo cookbook, and while it does contain 100 master-recipes, the cookbook is actually an exploration of 20 cooking techniques that, should you master them all, you can consider yourself about as skilled as most professional chefs. Although Ruhlman considers himself a home cook, this book won the 2012 James Beard award for best cookbook. And it’s no wonder. Each of the 20 chapters intensively covers a subject of critical concern to the cook. Chapter 2 is all about salt, “our most important tool.” In it he explains the different types of salt and their best uses, why you should never use iodized table salt, why salt needs to be applied throughout the entire cooking process, the chemical and physical effects that salt has on raw meat as well as vegetables and fruits, what properties change about water once salt is added to it, how salt interacts with oils and fats, the role of salt in desserts and pastries, brining and preserving, and how to deal with a dish that has been oversalted. And that’s just in the first 3 pages of that chapter! The recipes that follow are everything from curing your own bacon at home to preserving lemons to the most delicious way to eat zucchini…raw but salted precisely! And while we’re on the subject of Ruhlman, I can also heartily recommend his little book Ratio: The Simple Codes Behind the Craft of Everyday Cooking. Powered with the knowledge from this tiny little book, you will never have to use a recipe again, even for baking. 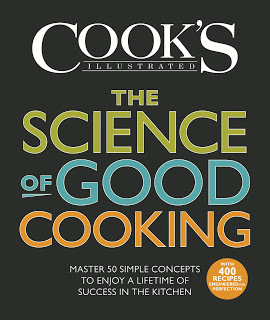 Cook’s Illustrated’s The Science of Good Cooking: Master 50 Simple Concepts to Enjoy a Lifetime of Success in the Kitchen. If there’s a food entity out there I adore more than America’s Test Kitchen, I can’t think of one. Their magazine, Cook’s Illustrated, and their legion of covetable cookbooks is unmatched by anything or anyone out there. Their show on PBS, along with Alton’s Good Eats, are the only cooking shows I’ve watched every episode of, repeatedly. If you’re not familiar with their concept, they take classic dishes and make them hundreds of times in a test kitchen, evolving each ingredient and technique carefully, until they achieve a near-perfect rendition of it. But it’s not what THEY think tastes the best…they have a blind panel of tasters, and they don’t stop with a recipe until their blind panel agrees unanimously that they’ve achieved perfection. Love your grandma’s lasagne recipe? Give theirs a try, just don’t tell grandma when you find your new go-to recipe for lasagne. They’ve been at this for over 3 decades, when a young, bow-tie wearing Christopher Kimball started the magazine, then later published classics like The Cook’s Bible and The Dessert Bible, and then began to take interest in developing self-called “bulletproof recipes” that would showcase an American working class favorite in its most perfect iteration. Thus was born America’s Test Kitchen, staffed with a legion of skilled chefs and backed by literally tens of thousands of at-home volunteers who test recipes for them. No recipe makes it into Cook’s Illustrated or their cookbooks unless the majority of these thousands of home cooks say the recipe was flawless and they’d make it again, and if their host of blind taste testers agree. From 3 decades of this research and testing, they have distilled 50 basic concepts that lead to success in the kitchen, and those are the 50 concepts in The Science of Good Cooking. Don’t worry. There are recipes in this cookbook. 400 of them in its 500+ pages. But they fall underneath the chapter concepts that educate you about WHY some recipes or techniques fail, when others succeed. Chapter 1’s concept is “Gentle Heat Prevents Overcooking.” We all know this. But do we know why? They proceed to tell you by explaining several experiments they did in their kitchen. They roasted 2 beef rib roasts, one in a 450 degree oven, and one in a 250 degree oven. They also placed a variety of temperature probes at different levels in each roast. Both roasts were cooked until the probe in the center of the roast reached 125 degrees (medium rare). Both roasts were rested 45 minutes and then sampled by the taste testers. Then they repeated the test 3 more times with 3 more sets of testers. What did they learn? I guess you’ll have to read the book to find out! Following several pages of education, they present you with bulletproof, “perfected” recipes relating to that chapter’s concept, like Prime Rib, Turkey with Gravy, Perfect Hard-Cooked Eggs, etc. What I truly love about America’s Test Kitchen is that they are perfecting the recipes that you and I make every day at home. Feel free to buy as many $50 glossy cookbooks from mega-chefs at legendary restaurants as you like. You’ll probably cook out of those cookbooks 2 or 3 times a year, at extraordinary cost and effort, and likely your friends and family won’t appreciate those sous-vide razor clams with bison demiglace and black truffle confit the way that you do. I cook out of this cookbook every week of my life, and many of their recipes have been flagrantly stolen and become my own. My second favorite cookbook of theirs is The Cook’s Country Cookbook, a vast compilation of reader’s favorite recipes from their magazines and TV shows over 3 decades. That link leads to a newly-revised version published in 2012, and it’s over 450 pages long. Talk about a reference book! Be aware, though, that The Science of Good Cooking has recipes that appeared in The Cook’s Country Cookbook, but were revisited and perfected…so the home fries recipe you’ll get in The Science of Good Cooking yields even better results! 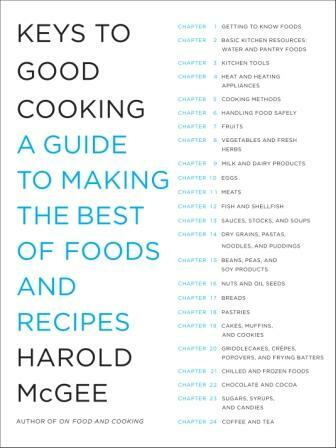 And last, but certainly not least, Harold McGee’s Keys to Good Cooking: A Guide to Making the Best of Foods and Recipes. Alton Brown may have started my thirst for geeky science books about food, but Harold McGee is the father of all things food-science. He got his PhD from Yale and later taught there before becoming the world’s eminent food scientist author. He has a lecture series named after him at the French Culinary Institute. McGee is the consummate food geek. He loves everything from the ancient history of cooking, to debunking common kitchen myths. His first book, On Food and Cooking: The Science and Lore of the Kitchen is a veritable tome that I’ve read cover to cover twice, but still haven’t digested even a fraction of it. It was written in 1984, and back then, only chefs understood it. It was considered a secret compendium of basically all the food knowledge on the planet. Why is pike different from grouper, and how is each best prepared? And, more importantly, when does the fish taste best? The day it’s caught? Or after sitting on ice for 3 days? Is the texture better if it’s flash-frozen on the boat, or brought in live in the boat’s well? How did the ancient Romans cook it? What is the conventional way to cook it? And guess what: the conventional way is WRONG, here’s the RIGHT way to cook it. I can’t recommend On Food and Cooking for the average home cook. Most of the people I’ve given it to can’t get through it. It’s a reference book, like the Oxford English Dictionary. You go to that book when you need to learn something about a specific ingredient or technique. For the more average everyday cook, McGee released this book, Keys to Good Cooking, and it’s still very comprehensive (576 pages long! ), but it’s more readable and more accessible. Chapters are organized the by types of food they cover. In the “Cakes, Muffins, and Cookies” chapter you’ll learn to “Rest cookie doughs in the refrigerator for hours to even out moisture and relax gluten, and to firm the fat and produce neater edges” and “Bake cakes in an electric oven if you have a choice. Gas ovens don’t retain rise-enhancing steam as well,” as well as “Low baking temperatures and a long baking time favor a higher rise and open texture. Higher temperatures and a quicker baking favor a dense but finer structure.” Over in the “Meat” chapter, you’ll learn that “The quality of most cooked meats deteriorates rapidly in the refrigerator, even in a stew or other dish whose overall flavor may improve for a day or two. Freeze leftover meats to keep them in good condition for longer than a few days,” and “Reheating meat causes the development of stale flavors, especially in poultry. Reheating above 140F dries meat out. So consider serving leftover meats in cold applications. Rewarm leftover meat as little as possible, consistent with safety. Turn it briefly in a pan of boiling liquid to kill any bacteria on the surface, then warm the meat through very gently.” There’s not a SINGLE recipe in this book’s 576 pages. You don’t use it that way. You read it through once, marking pages that have info that you’ll use daily to better your skills. Then you leave it easily accessible on the shelf. When you’re ready to make cookies, cook a roast, freeze ice cream, or bake a pie, pull the book and read that relevant section and adjust your recipe according to his solid information. Your recipe will turn out better than if you had followed it alone. And there you have it. What I consider to be the 5 best cookbooks out there. None of them are quick, easy reads. They are all dense and rich with the best information we humans have accumulated over the past several thousand years. These are the 5 books I’d take with me to a deserted island, or to the set of a reality TV cooking show. They are books I lay hands on almost every week. They are stained with wine and oil and chocolate and warped from chicken stock. They are, in my kitchen, absolutely indispensable. Far more so than my own meager first attempt at cookbook writing, Food for Thought: Every Recipe has a Story. But, hey…ya gotta start somewhere, right?